I'm excited I managed to complete my reading goals last week. I finished reading Incarnation, and I finally read Seed which was such a great read. I'm giving away a copy of Incarnation, so be sure to fill out the rafflecopter before the giveaway ends tonight. 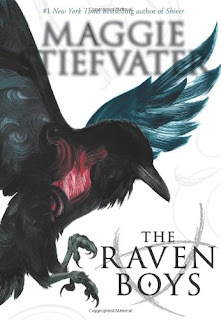 I just started reading The Raven Boys by Maggie Stiefvater. It got really great reviews last week so I'm checking out what all of the buzz is about! I may break down and read Ashen Winter by Mike Mullin this week. It's not released for another month almost, but I can hardly stand to wait any longer. Otherwise, I will go where my reading mood takes me! I hope you guys have a really great week filled with lots of great reads. Reading whatever you feel like is great. I tend to plan ahead, but this month I've been waiting to choose my next read until I've finished the one before it. I think that's the best way to choose your next book. My mood shifts regularly between books. I'm having trouble getting in The Raven Boys so far, but I'm going to give it more time. I really want to read Ashen Winter sooner than later! I love that: I'll go where my reading mood takes me. Just how I feel this week too. :D I'm trying to get back to listening to my mood more these days. I've got 3 books I want to read, but sometimes I am easily tempted by others! ;o) Have a great week of reading. Stiefvater is an excellent author - loved her werewolf series. REally written differently than whats out there right now. The Raven Boys is the first book I've read by Stiefvater. She seems to have a big following, though. I enjoyed the Shiver series so I am interested to see how readers are enjoying The Raven Boys. I tend to have a line up of review books so I rarely get to go where my reading mood might lead me. I may try that one month soon. Happy Reading! I try to accept very few review books these days so I can read more for pleasure. Happy reading to you, too! My reading is definitely dependent on my mood. That's why I tend to start a new book rather than finishing one I really, really should! Oops, I do that, too! I'm glad you accomplished your reading goals. My favorite book this week was Tuesdays at the Castle by Jessica Day George. Please come see what I'm reading now. I finished a lot of books last week. I have no idea what I'm reading next. Here's my It's Monday! What Are You Reading? I hope you will stop by! Options are good - as long as you don't have the book plague and nothing sounds good! I just picked up The Raven Boys and have heard great thinks about Ashen Winter! You have a really great week, too! I think I have Raven Boys for free from Amazon. The cover isn't that appealing but I heard it's great! Love how you let the mood take you towards your next reads.. hate how my review schedule inhibits that option. Enjoy your week! Here's my Monday post. SEED and RAVEN BOYS are both in my TBR stack as we speak. i have to do some catch up reading but once that's through I plan to dive into some horror since that's what I'm definitely in the mood for of late! Hey, Becky! Horror is a GREAT mood to be in. :) You will definitely love Seed if you are in the horror mood. I keep hearing great things about Raven Boys, I hope you're enjoying it. I hear you. I have to be careful not to check a book out until I'm ready! I love the cover of The Raven Boys! I really want to read Raven Boys!! Its my mission to track it down this week to read next week. I'm having that same mission with Ten right now. :) I hope you get a copy soon! I have so much love for the Raven Boys!! I also have Ashen Winter, but I really need to read the first book first! I'm hoping to get really hooked into The Raven Boys soon. Yes! You do need to read Ashfall!! I hope you are enjoying your reads this week! I can't wait to hear what you think of The Raven Boys.